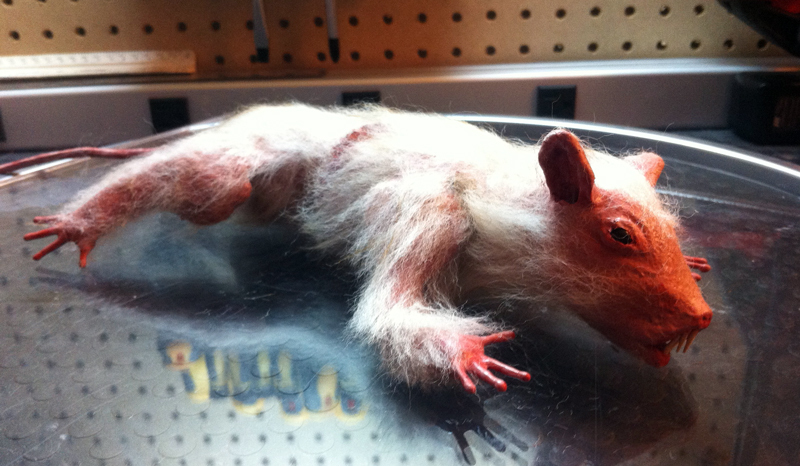 We were recently given an interesting challenge: Create a rat prop that has basic articulation, can be ripped apart at the midline, and would look realistic on a dimly lit set while being devoured by a hungry zombie. Normally this would be an easy task: Sculpt the rat, make some molds, cast the rat, build an armature, articulate it, and add the finishing touches (hair, teeth, claws, etc). The challenge was that we had less than 3 days, working only 2-3 hours a night due to our existing workload. We love a good challenge! The clay we used For this project was Chavant NSP soft. This softer clay does not hold a lot of detail, but allows for quick sculpting of a basic form. Because time would not allow for great detail, we went for speed. The body and head were sculpted first, and the ears, feet, and tail were added later.